Having a food pantry could be really helpful to each household’s kitchen. Of course, it can only be such, if you manage to keep it organized and neat. If you live in a small home or apartment, the pantry is considered a must. It can come as a real relief to the person doing all the cooking. To know how to keep the pantry clutter-free is very important. 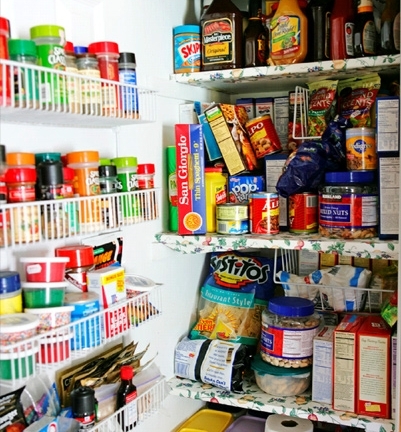 This means to arrange the entire pantry’s content in such a way that you have no difficulties finding whatever you need. A stocked pantry saves you countless trips to the store, which is great for people who live in secluded areas, for example. Once you are already familiar with the bare necessity of owning a pantry, take a look at the following ideas for keeping it organized. Because of the pantry’s deep shelves, each item needs to be made easy to reach. Keep items that you use on a regular basis at the front of the pantry. The shelves of some pantries are on rails, so make sure that they are kept on the rails so that they could be pulled out effortlessly. Take full advantage of the space you have. Use the full potential of the pantry space. Adding more shelves is better than stacking each shelf with twice the load that it is designed to hold. This can cause the shelf to break, which will result in a big mess. Hanging a shoe rack on the door’s inside is another option of obtaining more space. Come up with a systematic storage plan. Remove odd-shaped containers. Bags of sugar, rice, pasta, beans, and other items in plastic type bags are not only difficult to be stored properly, but can also be easily torn and cause a big mess. Use plastic containers to store food items. They are stackable and you can keep things in better order. Products that are not kept in their original containers should be labeled. Especially spices which are usually easy to be mistaken. Easy to spill items are to be put on lower shelves, at or under eye level. Canned foods and bottles shouldn’t be put on higher shelves. Try placing all labeled containers with the labels facing to the front so you know what they contain without having to dig through everything. Try to put as little glass objects in the pantry as possible. Even though they can be put in the microwave and are basically easy to use, they are also break easily. It might be a good idea to keep a small stool nearby as well. It is ideal for the purpose of helping you to reach the higher shelves. Don’t just organize the pantry. Do your best to KEEP it organized. Follow a routine. Keep a watchful eye on the expiration dates. Rotate the food. Don’t let the food in the pantry go bad and go to waste. You can only gain from having a food pantry. It will make your time spent in the kitchen a lot easier. Take the time to organize it. It is worth it. Guest Post Bio: Miranda is a housewife, passionate to share her experience for clean and healthy home. Read more at www.handymoves.co.uk.